Years ago (2010) I realized that if I wanted to delve deeper into my understanding of Yehovah’s word I had to go back to the original language and learn Hebrew. I knew that those who create translations do so in light of their own doctrines and traditions and with the need to sell their translation to a “broad” audience. How many of these translators have left the country of their birth and now keep only Yehovah’s statutes, judgments and ordinances? I could not get an accurate translation with all these factors perverting the eternal and unchanging message that Yehovah has for His set-apart people, so I had to learn Hebrew for myself. But for someone like me who had left the kingdom of His birth and wanted to live and teach only His ways this became even more difficult. There are many teachers out there for those who want to learn Hebrew; but for me, I saw two hurdles. Begin To Learn Hebrew Today! And so I began my internet search to find a place where I could learn Hebrew. I visited many sites and finally found Jeff A. Benner’s site. Jeff is the author of the wonderful book called “Ancient Hebrew Lexicon of the Bible” which discusses the Hebrew picture language and who also has made his work available to all e-Sword users through his free application for that program. A friend had given me his book several years earlier; and both it and the e-Sword application had given me new light many times in my studies. On Jeff’s site I found a tutorial designed for those who are desire to learn Hebrew. The first 12 lessons are an introduction of the Hebrew alphabet and even includes audio files (you can right-click on those and open them in a new tab) to improve your understanding. 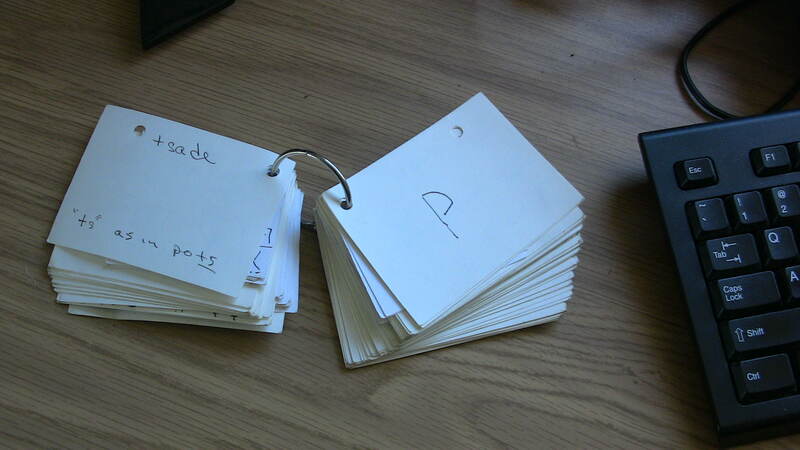 Each day I did a lesson, and after each lesson I made myself a set of flashcards for each letter I had learned and the vocabulary words for that lesson. Then, throughout the day, I reviewed my cards. Next came a set of 5 lessons on verbs and the another 5 lessons on nouns. Both verbs and nouns have prefixes and suffixes (even infixes, I learned just today) that alter how a specific word is translated. At the end of these 22 lessons I had learned enough to decode and understand the majority of the words in the Hebrew scriptures. It took me about 30 days to get through these 22 lessons with daily reviews; that was 3 years ago. These lessons gave me a wonderful foundation to build my daily study on and now I am so much more comfortable in the Hebrew. Would I call myself proficient in reading the scriptures? Ha – far from it. But, Yehovah has used what I have learned to reveal many things, things that many who are “proficient” have never seen, and I am thankful for that. In my e-Sword, the place I do all my study, I have two interlinear Bibles; which allow me to go back to the actual Hebrew text. Many think they are going back to the original Hebrew when they click on the Strong’s number for any given word, but fail to understand that number is just a root for a given word and not the actual word. Add to that the fact Mr. Strong was against men repenting and keeping the statutes, judgments and ordinances as given by Yehovah through Moses, and you begin to see that he too, just like the translators, had his particular slant. To overcome this I utilize 3 other lexicon/concordance type applications in my e-Sword; The Complete WordStudy Dictionary, the Ancient Hebrew Lexicon of the Bible and Brown-Driver-Brigg’s Hebrew Definitions. But I have to say that the best way to understand any word is within the Words given by Yehovah; always look for where the Word defines the word. That is why I wanted to learn Hebrew. Are you serious about going deeper into Yehovah’s word? If you are, then make it a goal to get through the first 12 lessons. You will be glad you did!